"We have a narcotic epidemic going on right now, right? So painless surgery with no narcotics afterwards is a bonus," says Dr. Reising. 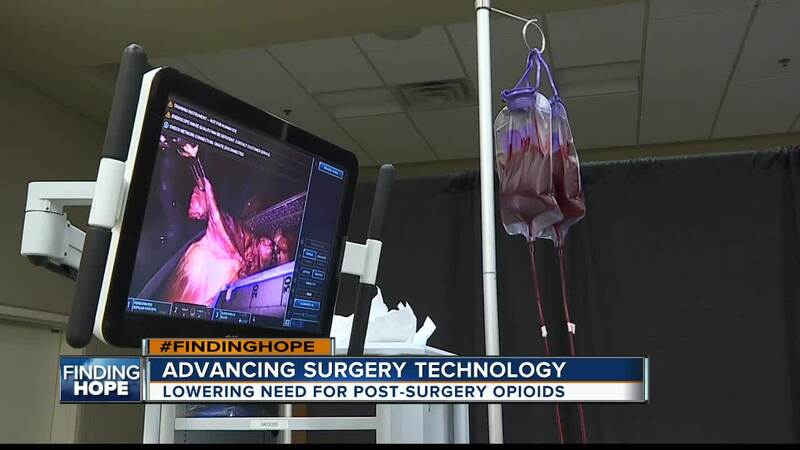 BOISE, Idaho — Advancing technology at Saint Alphonsus in Boise is lowering the need for opioids after surgery. It comes as more and more professions are turning to technology and engineering to improve existing procedures. Earlier this month, we introduced you to some local aspiring med school students as they got to test out the surgical robot called "Da Vinci." Doctors say 10 or 15 years ago, patients undergoing open surgery on their esophagus would need to be hospitalized for two weeks, but now they're going home in five days. That's because advancing technology is allowing the same procedure to be done with only a tiny incision. "No blood transfusions, hardly any blood lose--some surgeries there's no pain and no pain medicine afterwards," Dr. Christopher Reising says. And that's a big deal. As 6 On Your Side has reported , nearly 80 percent of current heroin users say they started first with prescription pain pills. And although it's a big change for surgery staff, they're glad to make the adjustments if it means preventing addiction among their patients. "Very precise operations, all because of technology," Dr. Reising says. "Steep learning curve to learn this, but it's definitely better for patients."